Flexi Brick Source...Simulated brick chimney chase light weight brick and mortar solutions...chimney caps, chimney chase covers roof flashings. Flexi-Brick and masonry brick. Great indoors and out! A favorite of designers. Adds value and charm to your home. Won't peel fade or crack. Custom designs and sizes available on request. Light weight eliminates need for extra roof support. Flexi-Brick is also available as individual bricks. Choose from 3 brick sizes, 7 brick colors & 4 shades of mortar. for use on your own designs. 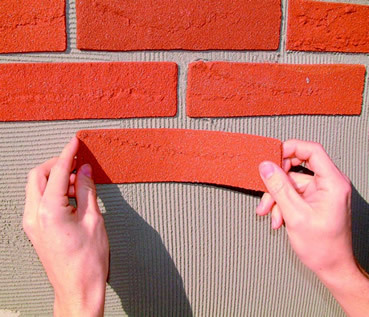 Flexi-Bricks Traditional chimney surrounds are sized, attached and pre-assembled to rigid foam sheets. 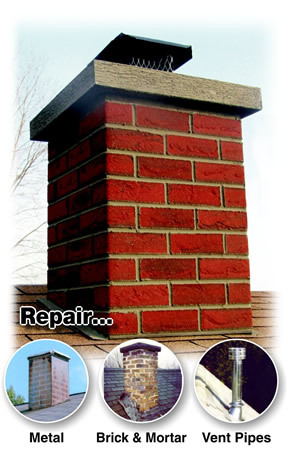 Flexi-Bricks Finger-Lock chimney surrounds provide 4 interlocking panels for larger units. 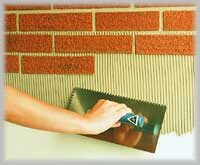 Apply small amount of the Flexi-Brick Mortar on a dry and solid surface. 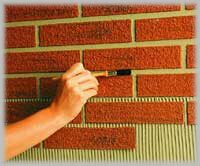 Attach bricks & smooth the joints with a damp paintbrush.